For whatever reason, sometimes there are periods of time when Mom just can't be devoting normal amounts of time to homeschooling. Pregnancy and a new baby are key times, but certainly not the only ones. Serious illness, depression, caregiving for other family members, accidents -- there are lots of times when Mom could be out of commission for a chunk of time. This week's Blog Cruise asks about homeschooling during pregnancy or with a newborn. It's been a few years since I've been in that situation, so I wasn't going to respond. But the more I thought about it, the more I realized that I do have some contingency plans and maybe I do have a bit to say. First and foremost -- there are two main types of situations where Mom will struggle to homeschool. Ones you know are coming, and ones where you don't know until it happens. And there are different homeschooling scenarios -- you may be homeschooling rather young children (2nd grade and younger), or you may be homeschooling middle-grade students (3rd-6th or so), or you may have jr/sr high students. For younger students, my advice would be mostly to chill out and not worry about it. Sure, make sure you are able to do the bare minimum to fulfill state laws. But if you have advance warning, pulling out a stack of Magic Schoolbus videos from the library, subscribing to an online program like Time 4 Learning for a time, getting hold of a stack of audiobooks... There is nothing wrong with a period of TV and computer based teaching. And no guilt allowed. Really. They will probably learn a ton. For those middle students, it can be a bit tougher. I wouldn't tend to totally chill out, but still... the library has a lot of great educational videos, there are a lot of great web-based programs that would be amazing for a month or two, and a lot of stuff really can wait. Of course, if you can schedule things so they take time off when you need them to, so much the better. But if not, shelve the teacher-intensive math program and have them drill math facts. Skip teacher-intensive anything and substitute something the kids can self-teach. For the older students, I'd sit down with them one-on-one and see what idea THEY have. Maybe they will suggest putting off a subject for a month and focusing instead on something they can do fairly independently. Maybe they could use an online math program. Maybe there is something they've been wanting to research, and doing a unit on that on their own would be perfect. Maybe this is the perfect time for a Home Ec credit. What I wouldn't want to do with an older student is to "just relax" though. Unless, of course, it is their serious illness, which is a different situation. But an older student should be able to take on nearly sole responsibility for at least some chunk of their education. Give them that opportunity. I'd bet that my fellow crewmates have a lot of amazing advice though, and their probably addresses pregnancy and new babies a lot more specifically. Go. Check them out. I'll try to remember to do a direct link when it is up. As part of the TOS Homeschool Crew, we were fortunate enough to receive Times Alive from City Creek Press. We downloaded the Mac version -- there is also a PC version available, and you can purchase it as a CD instead of downloading. 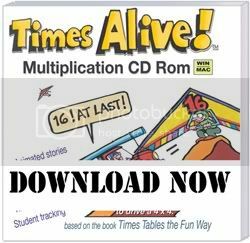 The Times Alive software is based upon the book Times Tables the Fun Way, which I've heard about but never seen. The basic premise of both the book and the software is to take the hardest to memorize multiplication facts and make up little stories about them. So facts like the zero's, one's, two's, five's and nine's are covered as a group, then the remaining facts get their own little story. The one on the cover of the software has to do with driving a 4x4 when you are 16. My older kids loved that one. Okay, so our experiences with the program. First, when you purchase a download version, you do need to wait a day or so to get the download link and code. Now, that may have been because I was getting a code to get the program free -- a regular paying customer might have more immediate access. The download process was painless. Downloaded, installed, and ready to go. I like that. Then my kids got to get started. One of the only things I do not like about the program is the sign-in process. When you click LOGIN, you get a box where you are told to type your full name. That would be okay the first time... but when you come back to the program the next day or the next week, you need to remember what exactly you typed last time. Did you put in just your first name? A nickname? First and last name? With an initial? Did you type it wrong? A very good program could have been made much better if there was the ability to choose a login name from a list after it had been created. My kids were all told that their login was their first name, and nobody ever had issues with typing it incorrectly. Just me... I created an account so I could play a little for purposes of writing this review. Did I sign up as Mom? Debra? Deb? And then you have to read through the Owner's Manual to figure out how to search to find user records. Oh -- and who I had using this? William (age 12), Thomas (age 10) and Richard (age 6). Okay, so you get signed in... At that point, you are presented with 18 lessons, with each lesson including multiple parts. Other than the final lesson, each lesson includes at least one movie. Almost all the lessons include a song. Each lesson includes either a quiz or a test. Towards the end, some lessons include more than one quiz or test. The above video shows you one of the little songs, for 3x4. Before this song, there is a video where the story is told, where the idea that one-two (twelve) is the answer to 3 x 4 is explicitly laid out (you can see a sample movie for 6x8 here). Then the above song is played, where it is assumed the student already "gets" the 1-2-3-4 idea. The only thing remaining for this particular lesson is a quiz (what is shown in the above clip is a test), where the student needs to fill in the equation 3 x 4 = 12 a couple times. Some of the lessons also include a "paint" section. The older two rolled their eyes every time one of these came along. Richard loved them. These, however, were one of the reasons both William and Thomas said of the program (quoting William, but Thomas said something similar), "I liked it. The stories were great, and easy to remember. But it was clearly meant for kids younger than me." One other very minor issue I had with the program, as the mom, is that in order to see my kids' progress, I have to log in as them and then look at the beginning screen and/or the student progress report (which is easily printable). To see the next child, I have to quit, which closes the program completely, and then restart the program and choose the next child. Just like I'd love to be able to choose an already established username, it would be nice to have an easier way to navigate from one progress report to the next. Not a deal-breaker though. We really enjoyed this product. I think it helped to solidify the math facts for Thomas and William, and Richard was learning them more slowly. Available for $44.95 for the download version (this link is for the Mac version, PC version is here), for a few dollars more you can get it as a CD-ROM. Disclaimer: As part of the TOS Homeschool Review Crew, I did receive a complimentary download of this program from City Creek Press. The fact that I received complimentary products does not guarantee a favorable review. It does guarantee a review. A fair review. But I am not going to praise something unless I think it deserves the praise. If I don't like it, you'll hear that. And hopefully with enough detail as to why so you can decide for yourself if what I hate about it makes it perfect for your family. For more about my take on reviews, visit my blog post here. Oh my! This book is totally not what I expected when I requested a review copy. I think I was expecting a Bible meant for early readers, with a lot of simplified text, or maybe a complete Bible. I did not expect a 'story Bible' format. I should have, the description is good. I just wasn't thinking, I guess. The Beginning Reader's Bible is gorgeous, and bigger than I expected (it's around 9"x10"). The illustrations are beautiful, and take up a lot of the page. But there is more text than I really thought there would be, I guess. 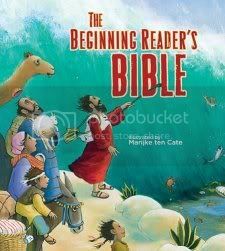 Since the first thing I turn to when deciding about a children's Bible is the story of Noah, let me use it to illustrate the features of this Bible. The story of Noah covers four two-page spreads. It is titled "Noah and the Great Flood" and it tells you that this includes selections from Genesis 6-9. It starts off looking like a Bible -- a bold 6 followed by a superscript 9, so you know you are reading Genesis 6:9. In this Bible, that reads "Noah was a good man. He walked with God." If you hover over the reference, you can see how that is worded in the ESV for comparison (this edition uses the International Children's Bible). The first two-page spread is about building the ark, and the illustration has the ark with scaffolding in the background, and Noah talking to skeptical people in the foreground. In addition to the Bible text, there is a box labeled "Pray God's Word" which includes words from Psalms. I love this feature (it is included in all the stories). The second two-page spread is inside the ark, with the animals boarding. There are two pigs, two zebras, two rabbits -- but there are more cows, and it is clear that one bird includes seven of the same kind. I love that touch. The third two-page spread has the most text, and the picture is of a realistic ark (no giraffes poking out the top) on a storm-tossed sea. The final two-page spread has the ark perched on dry ground, a rainbow, Noah with his arm around the Mrs., and the animals filing off. The text is fairly brief, with the promise not to destroy the world by water. And there is a yellow box that includes two features common to each story -- a memory verse (Genesis 9:13 in this case) and an activity. This time, the activity is to draw a rainbow using all your favorite colors, and to remember that God always keeps his promises, and you should too. There are 13 stories from the Old Testament, most being the "big" ones you'd expect, but also stories like Rahab and Nehemiah. There are 13 stories from the New Testament, again mostly covering the "big" stuff. The final section includes a variety of extra resources, like the Ten Commandments, the 23rd Psalm, and verses from Proverbs. There are also lists of the books of the Old and New Testaments, the apostles, and the tribes of Israel. Overall, this Bible is unique among all the Children's Bibles I own. I think it is going to be a nice transition from the "reader" type to a "real" Bible. My kids loved looking at the pictures. It turns out that it is in between my kids -- a little too young for one, and just a bit too much for the next. I look forward to using it with him in another few months though. We love audiobooks in this house. We also love fairy tales. 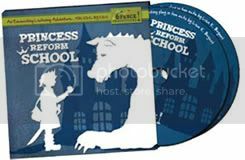 So when I had the opportunity to review a couple of CDs from 6 Pence Productions -- one called The Fairytale Collection, the other called Princess Reform School -- well, obviously, I jumped at it. 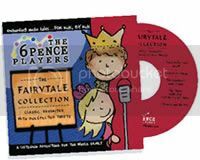 6 Pence Productions is a family company -- "The 6 Pence Players bring children’s theatre to life for young ears by young voices! So, sit back, close your eyes, travel to far away lands filled with whimsy and magic, and let your imagination soar!" Voiced entirely by kids, aged 5-17, we really enjoyed these. The Fairytale Collection is a set of five fairy tales, with a bit of a twist. The five stories are fairly familiar -- Three Billy Goats Gruff, Cinderella, The Emperor's New Clothes, The Three Little Pigs, and Princess and the Pea. They suggest this for ages 3-8, but my big boys enjoyed it as well. They liked picking out references to works such as MacBeth, and had fun trying to guess what strange little twist would come up next. My four year old simply enjoyed the stories. I think anyone would enjoy this production, but it is probably best for children who are already familiar with the traditional stories. Princess Reform School is their other production. I was a bit hesitant about this -- I mean, from their website: "Societal expectations, pressures and the role of modern-day females are questioned by a gaggle of familiar, and brand new, fairy-tale princesses." Mmm. Well, we did decide to check it out. This one is recommended for ages 6-13, and I do have to say that it did lose my 4 year old. She listened, sort of, but had a tougher time following this. My boys enjoyed it. It's an hour and a half, and the fact that dragons are a part of it probably helped. The kids sound so professional, like in the Fairytale Collection. We enjoyed these, and will watch to see what the 6 Pence Players come up with in the future. Disclosure: As a member of Christian Mommy Bloggers, I received these CDs in exchange for my review. The fact that I received complimentary products does not guarantee a favorable review. It does guarantee a review. A fair review. But I am not going to praise something unless I think it deserves the praise. If I don't like it, you'll hear that. And hopefully with enough detail as to why so you can decide for yourself if what I hate about it makes it perfect for your family. For more about my take on reviews, visit my blog post here. As part of the TOS Homeschool Crew, I have had plenty of opportunities to test out math programs. Most are geared primarily to younger kids, elementary aged. 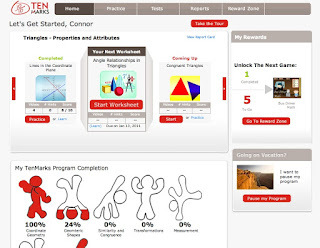 Recently though, I have been working with TenMarks, a program that is geared to the older ones as well, with levels stretching from 3rd grade through Algebra II. 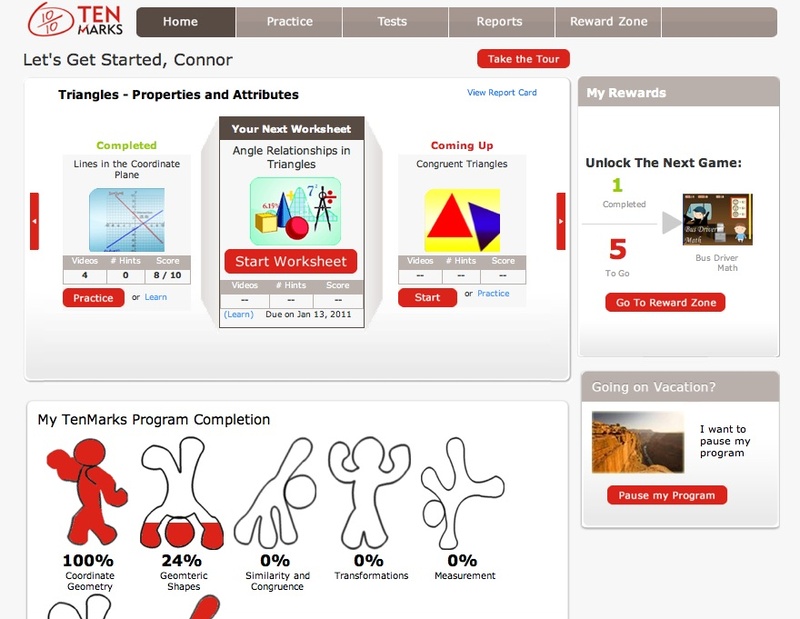 I first really learned about TenMarks through a webinar they gave online in conjunction with The Old Schoolhouse. (I highly recommend watching the webinar yourself!) They had a promotional offer there, so I signed Connor up for Geometry. Then I got the chance to have two of my children use the program as part of this review. So William and Thomas were signed up for 6th and 4th grade math respectively. I have continued to pay for Connor's subscription, so this review will include my observations for all three boys. I'm going to cut to my bottom line first: I am seriously considering purchasing a full-year subscription for Connor right now instead of continuing to pay month-to-month. William and Thomas have a wonderfully generous six-month subscription, so I'm not forced to make a decision about them quite yet. I am quite certain I will continue on for William though. Okay, so let's back up and talk about what it is. 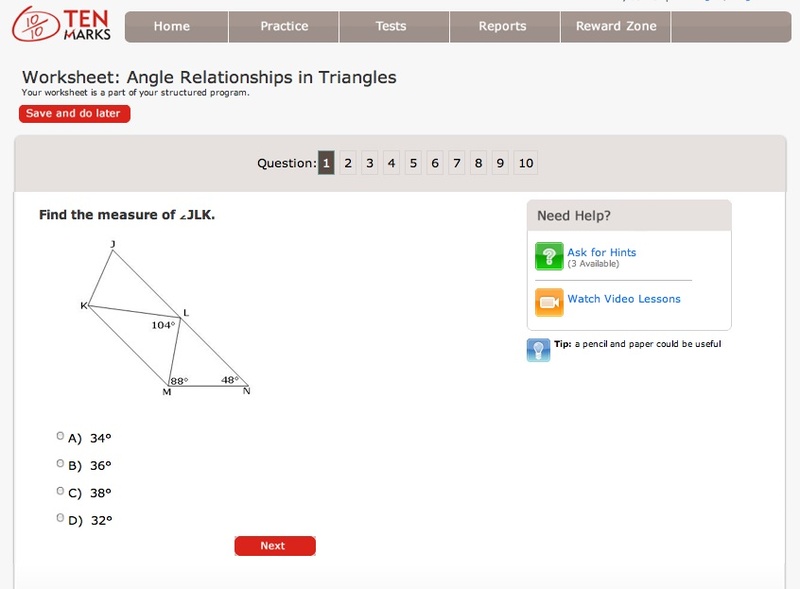 TenMarks is an online math subscription where the kids get the chance to watch videos and complete worksheets (see below) at their level. There are hints available for the problems, and once you have submitted your answers, you can watch each individual problem being worked out. If the child does well (answers the questions without using a lot of hints) the program automatically goes on. If the child does not do well, additional worksheets will be generated where they are not quite getting it. Completing a certain number of worksheets unlocks some games, which my kids enjoyed, but not so much that they do the games only and not the work. 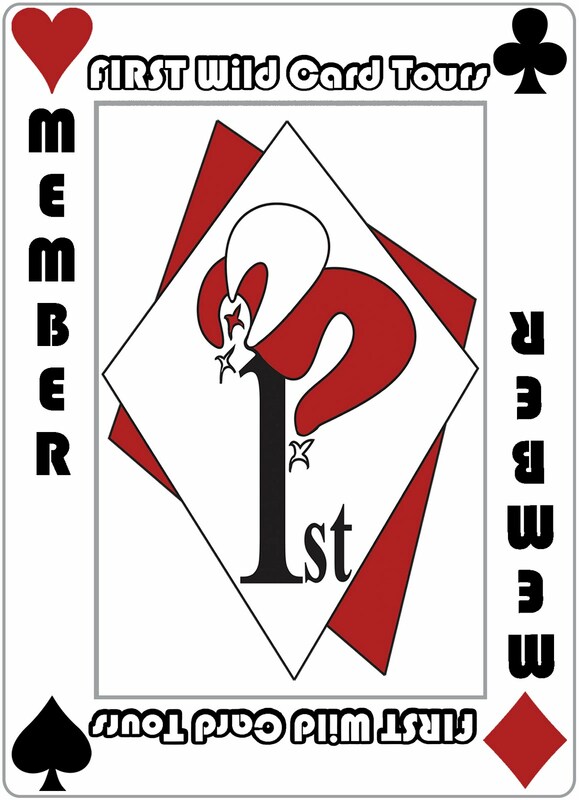 There is also the ability to set up individualized rewards. We haven't done anything with that. That description doesn't do it justice. Connor -- He's working in geometry, which is an area of math where I struggle. So far, I think I am able to understand the work he is doing. 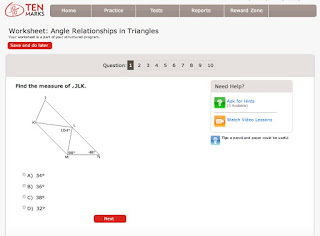 But I lack confidence in geometry, so having him use TenMarks relieves me of a lot of pressure. He watches the video, he works out the problems, and he generally does pretty well. When he doesn't do well, it is always because he thought he could get away with skipping the video. He's a slow learner, sometimes, but I think he has finally learned that watching the video is in his best interest. What I love about TenMarks for him is that he is having the material presented to him in a manner that is different than what he is used to, and the questions are worded in a way that he really has to think about them. Answers are multiple choice, so sometimes he can "cheat" on a problem and not actually have to work out the answer... but so far, that has usually been because he understands the concept well enough to grasp that there is only one reasonable answer available. That works for me. Quite well, actually, as that is one of the things they really push in SAT Prep courses -- learning to recognize when you actually need to do the math vs. when just applying the math concepts to the situation will make the answer obvious. William -- he's working in the 6th grade math, and it is going very well. I have had a couple of frustrations with the program for him though. First is that his reading level is not at grade level, so sometimes he gets a little overwhelmed with all the words in a problem. But since the instruction is via video, at least the teaching part he can handle on his own. Especially with newer concepts, though, he will get brain overload going with reading the actual problems. That means that I (or his brother) have to be available to keep him from stressing out. The other frustration is that the program doesn't necessarily default to presenting information in a sequential order, and I have not found a way to figure out which topics build on each other. So a couple of weeks ago, he had a worksheet that involved long division of decimals. For a variety of reasons, he hasn't really done long division before now, so throwing decimals into that was far too many new steps at once. Not a big deal, I knew we had avoided this. So we spent a day or two working on long division, and THEN came back to TenMarks, where he was able to easily complete the work. That didn't bother me at all. But (again, going with the default order that the program set up for him) two or three worksheets later, he is being asked questions like "write a division equation for this multiplication fact: 6 x 8 = 48"
While on the one hand, it is nice to get an easy section after he struggled with parts of the last one, it also seems like it would have made sense for the section on whole numbers to appear before the section on decimals. So I sound like I'm ragging on the program here, but I am not. This has been fabulous for him. The questions challenge him, but he knows there are only 10 of them, and if he does well (he always does) he'll be done. Thomas -- he's working in the 4th grade math. He has some of the same issues with the reading level, but not so bad. For one thing, the math itself has tended to be a little on the easy side for him, so he is better able to handle the challenge of the reading. I also haven't noticed the order of his material seeming weird. I also notice for him that the multiple choice answers usually don't lend themselves to easily being able to narrow down an answer. Probably because there isn't a whole lot of "theory" in 4th grade math, it is mostly calculation. Overall, I am incredibly pleased with TenMarks. There is the occasional error in the worksheet questions, but there is a tab to report a problem and they've been wonderful in responding to those. I think the videos are quite well done, and I really appreciate the "not quite US" style that seems to require more mathematical thinking than do most American materials I've seen. The kids are able to follow the videos quite well, and I guess the biggest thing is that they do not complain about doing math (except when a topic is totally over their head, which has only happened with the long division of decimals topic). This is an online subscription, starting at $10/month, with discounts offered if you go for a six-month or one-year subscription. Disclaimer: As part of the TOS Homeschool Review Crew, I did receive two complimentary six month subscriptions for TenMarks. The fact that I received complimentary products does not guarantee a favorable review. It does guarantee a review. A fair review. But I am not going to praise something unless I think it deserves the praise. If I don't like it, you'll hear that. And hopefully with enough detail as to why so you can decide for yourself if what I hate about it makes it perfect for your family. For more about my take on reviews, visit my blog post here. 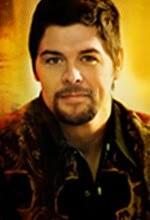 Best known as the powerhouse lead vocalist for one of Gospel’s most acclaimed and awarded groups, The Crabb Family, Jason Crabb’s career has already been an incredible ride. While garnering multiple Dove Awards, three GRAMMY nominations, and 16 #1 singles with his family, Jason has become one of the Christian music community’s most acclaimed vocalists. Crabb has become a “fan favorite” at the Grand Ole Opry, appeared regularly on the Gaither Homecoming Series videos, and was honored to sing for the Rev. Billy Graham’s final crusade in New York. He has sung with the legendary Brooklyn Tabernacle Choir, among many other diverse and prestigious opportunities. His solo album debuted at #1 on Nielsen SoundScan’s Christian/Gospel Christian Retail chart the week following its release in 2009. More than anything else, this book is about an amazing God who reaches down and touches ordinary lives. It is a testimony of all He has done for Jason Crabb's family and for the people he has been privileged to meet throughout the years on the road. He wrote this book because every soul walks through the fire of adversity. Most of us have walked that plank several times. Whether the life of your dreams is unfolding before your eyes, or you are losing hope that it ever will, you have tasted a trial or two. No human being with breath in his lungs can say, "Difficulty has never darkened my doorstep." You may have entirely different life experiences than Jason. Yet, when you look in the rearview mirror, you can see the high points and low points of days gone by. The important thing—the truly amazingthing—is that like Jason—you came through all of it. There may be a scar or two to remind us of the past, but the past is behind us. 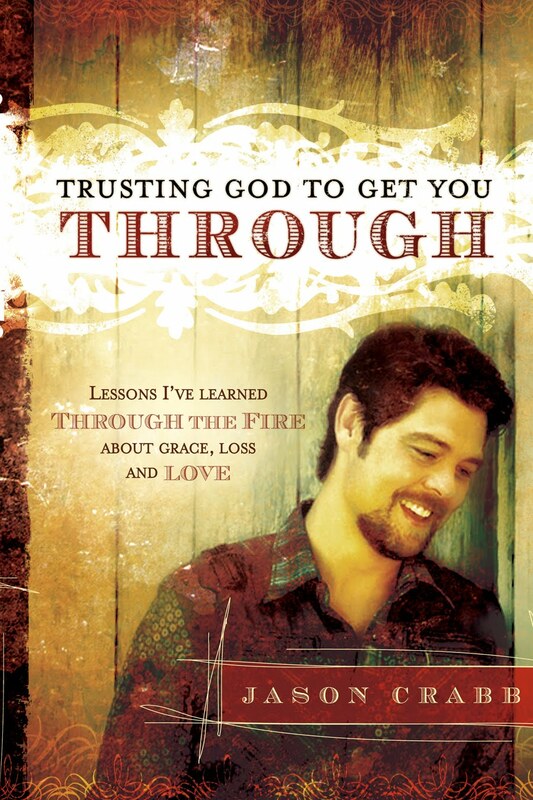 Jason Crabb wants you to know that you came through it for a reason.There is something God is yet going to do with you. The important things to remember is that you can go through the fire—any fire—with God's help. My take: This book is just so easy to read! Jason Crabb writes like he's sitting across the table with a cup of coffee and just talking to you. You can see that from reading the first chapter below! I have really enjoyed this book, though I'm sure talking about miscarriage in the first chapter made a huge difference -- I guess it is just how real Jason is (and his wife too, as she tells her side of the story some too). The perspective of going through tough times and being able to look back and see how God truly is working all things together for good... priceless. ...Trust the hand of God, He’ll shield the flames again. Things I could not understand. Every song I sing has lyrics centered on a strong gospel message, although the sounds are similar to musical genres that are popular today. Sometimes those familiar styles open doors to exciting and unexpected opportunities to sing outside of mainstream gospel circles. I’m jazzed by invitations to take part in nontraditional gospel events. One such invite led to the stage of the Grand Ole Opry, a place like no other in the world. Just being on that stage is an honor; how that particular night played out—well, it added to my amazement and demonstrated God’s willingness to use unusual circumstances in the fulfillment of His will. Talk about irony! The sponsor of our portion of that night’s program was a watering hole in Nashville. You heard me right; our segment was sponsored by a bar—and what an amazing night it turned out to be. From that iconic stage I was privileged to share a testimony that was fresh in my heart. “Through the Fire” was part of my testimony that night. Like all my dad’s songs, it speaks to experiences that are common to all people. The song has run like a thread through the fabric of my own life. I told the audience at the Grand Ole Opry as much, explaining how the song had ministered to Shellye and me during a painful season. It was a poignant moment when I shared how God had brought us through the trauma of losing two precious babies in separate miscarriages. Although the shock of those losses was still fresh in our thoughts, fresher still was the miracle of God in bringing our season of heartbreak to an end. That night—February 14, 2003—I had the pleasure of sharing breaking news from our house: Shellye and I had just experienced the birth of our first child! Our daughter, Ashleigh Taylor, had been born the day before, and she and her momma were doing just fine. Shellye and I walked through some fire. Yet God brought us out and blessed us—radically! Today we have two daughters, Ashleigh Taylor and Emmaleigh Love. They are as beautiful as can be, just like their mother. I will tell you more about them later, but first let me tell you about the love of my life. I guess I played down my curiosity in front of my friend, but I thought the girl in the picture was beautiful. Little did I know that someone had shown that beautiful girl a picture of me. It was a shot from the album Looking Ahead, a record our family made even before we started singing full-time. I had a crazy hairdo at the time—a comb-over with a curl that dropped right down the center of my forehead. My hairstyle looked like a 1950s throwback. Shellye wasn’t impressed. Sometime later, the Crabb Family was invited by Kentucky Educational Television (KET) to be part of an outdoor concert in Rosine, Kentucky, the home of bluegrass and the birthplace of Bill Monroe, the man known to this day as the Father of Bluegrass Music.1 KET asked us to sing for a documentary they were making about Kentucky music. Friends had told me ahead of time that Shellye planned to come and see me at the concert. Things didn’t go exactly according to plan, however. She and her folks arrived after our set was over. We were headed off the stage when I spotted Shellye getting out of a car. I never took my eyes off her; I watched her walk across the field and toward the stage. I might not be able to tell you what Shellye wore yesterday, but I can tell you exactly what she was wearing in Rosine. She cut straight across that field in blue jeans, a flannel shirt, and roper boots. “Yeah, I want to meet her,” he said. “I’m going to church,” she replied. “Well, good, because I’m going with you.” I didn’t ask her if I could accompany her; I just told her we were going to church together. It was bold, but it was OK with Shellye. She was comfortable knowing that her stepmom knew me. In fact, her stepmom was Kathy’s cousin. So, I wasn’t a complete stranger, and church seemed like a safe first date. In the meantime, we tried to get out of the blistering heat. The only place that was even slightly cooler than that hot Kentucky field was the inside of our old GMC bus. It was our family’s first bus, and it burned almost as much oil as it did gas. It wasn’t pretty, but it had places to sit and offered shelter from the sun. It even had a recliner that we had installed for on-the-road comfort. Shellye sat in the recliner, and I stood in the stairwell. We just talked and talked until it was night. By the time we left for church, one thing was certain: our meeting was no accident. The hours I spent with Shellye were like nothing I had ever experienced. We were clearly drawn to one another and found it easy to talk and laugh together. It sounds like a cliché, but we felt almost as though we had known each other for some time. That night, Shellye and I went to church. At some point, I learned that she was seeing someone, but the relationship was not serious. The next day, the fellow Shellye had dated called her before I did. She refused to come to the phone. She had already decided that she didn’t want to talk to anyone but me. When I got to Shellye’s house, she and her twin sister answered the door. Seeing the two of them caught me by surprise, but I got over it. There was no doubt in my mind: there was only one Shellye, and she was the girl for me. The memories of those days are strong. The slightest reminder can trigger my senses and transport me back in time. During our courtship, I made it a habit to pick up some watermelon gum and a Dr. Pepper on my way to Shellye’s house. To this day, the sight, smell, or taste of either one affects us, and each year the first October breeze reminds us of the day we met. Years ago, I prayed and asked God to bring the right woman into my life. I knew it was important to find not just a good woman but the right woman. God answered my prayers. Shellye is everything I need and everything I am not. She helps me to remain rooted in what matters. She helps me to strike a healthy balance between family and ministry. She helps me to stay grounded when I’m on the road. Shellye is an amazing wife and mother and the perfect helpmate. Of course, she is much more than that. Ask anyone about Shellye, and they will tell you that she is a rock. In fact, that’s what they call her: the rock. She is content in life. She is comfortable with our roles and all they entail. She is supportive of me while at the same time fulfilled as a stay-at-home mom. Her deep contentment brings me peace. I know that when I’m on the road, I don’t have to worry about her or my kids. Shellye has it all in hand. I can’t imagine a better home life than the one I’ve got. As a father, I can’t imagine a better mother for Ashleigh and Emmaleigh. One of my favorite pastimes is watching Shellye and our girls interact. She’s got a way about her that brings tears to my eyes. Whatever the activity, Shellye is right beside them. When they are learning their Scripture memory verses, Shellye is there. Already, Ashleigh can quote nine verses of a psalm at a single clip, in part because Shellye is so supportive. As a mom, she is dedicated to helping both our daughters succeed in their endeavors. Not that being a full-time mom is easy, especially when your husband travels as much as I do. Shellye is the nightly homework helper, the daily taxi, the resident chef, and keeper of all things domestic. Yet she relishes her life. She sincerely enjoys shuttling the girls to and from school and cheerleading practice—and not as a drive-by mother, either. Shellye is very involved at our girls’ school and finds ways to contribute and be a blessing to the staff and faculty. As a life partner, Shellye is my perfect match, emotionally and otherwise. I value her opinion. She is smart, objective, wise, and knows me better than anybody else does. When questions arise as to the direction of ministry or the choice of songs for an album or which producer or record company is right, I know I can go to Shellye for straightforward, reliable input. Being transparent and at ease in our conversation is something we have been able to do since that first day in Rosine. There are no egos in the way. We just keep it simple and honest. That freedom allows us to grow individually and as a couple. After a two-and-one-half-hour concert, Shellye will say, “Honey, that set was too long.” I don’t try to convince her that a one-hundred-fifty-minute concert is a great idea. I take my wife’s advice seriously; I know she has my best interests at heart. At the same time, she knows I trust her and won’t be offended by the truth. In the end, if you can’t tell each other the truth, you have to wonder how solid your relationship really is. One of the reasons Shellye and I came together in the first place has to do with transparency. At the very beginning, it was clear that Shellye loved me for who I was and not what I did. It wasn’t about the music, the recognition, or anything like that. In fact, when we first fell in love, she didn’t know the extent of my musical and ministry life. Shellye liked me as I was. As a result, she brought out the best in me. I had experienced relationships that lacked that kind of truth. In school, everyone had their crush and their reasons. I was a country kid with no fancy home or cars or anything to draw attention to me. I wasn’t very popular with the girls. In fact, they usually gave me the brush-off. They weren’t interested in me—at least, not until I sang at a school variety show. Then, all of a sudden, the girls noticed me. Suddenly, I was in demand. Shellye did not operate that way. She loved me first and learned about what I did afterward. We were blessed in that when we started our relationship, we truly loved each other. We weren’t drawn by illusions or impressions or any other distractions. That has proved to be a good foundation for the rest of our life together. I met Jason in Rosine, Kentucky, when I was sixteen years old. In all of Kentucky, I may have been the only person who hadn’t heard of the Crabb Family. All I knew was that my stepmom and my father were taking me to a concert. There was a guy there my stepmom wanted me to meet. Without the slightest hesitation, he said, “I’m going with you”— which he did! That is where our relationship began. We hit it off from the start, but since we lived seventeen miles apart, it wasn’t easy getting to see one another. Not only that, but Jason was on the road a lot. Often he would come in during the middle of the week, wake up at six in the morning, and drive over to Central City, where I lived. He would take me to school and return in the evening to pick me up and take me home. The posters let everyone know when the Crabb Family would be singing. Once each month, they gave a concert in Owensboro, Kentucky. It took lots of posters to get the word out. That is how we spent most of our dates. And since the Owensboro concerts happened every month, we were never done hanging posters. Jason and I dated for three years. In 1997, I graduated from high school, and on May 12, 1998, Jason and I got married in my home church. I was nineteen, and he was twenty-one. Our backgrounds were very similar; my parents divorced when I was only four years old, and my dad raised me; my twin sister, Kellye; and our older sister, Leslie. Because my dad worked on the railroad and was gone a lot of the time, my grandmother lived with us and cared for us kids. She was very involved with my sisters and me and played a very significant role in our lives. So did Dad. He worked really hard to make a living for all of us. My dad and grandmother did a great job raising us—and they made sure we were in church every time the doors opened! After two years of marriage, Jason and I learned that I was pregnant. We were scared, yet excited. Starting a family was something we both wanted very much. But almost as soon as our dream was underway, it was threatened. Early in the pregnancy, I started having complications. Soon afterward, I had a miscarriage. Jason and I were devastated to lose our baby. We couldn’t understand why this had happened to us. About a year and a half later, I got pregnant again. Our hopes were high, but we lost that baby too. It hit us hard. I remember asking the Lord over and over again to give me the strength to get through the ordeal. He did. Yet getting through the miscarriages was only part of the process. For so long I struggled with the loss of our babies and the disappointment that followed. At times I almost questioned God; I wanted to ask Him why He allowed everyone but us to have babies. The loss of our children did not make sense to me. Still, I kept praying. At some point I realized that my focus was centered on me and what I wanted. I was preoccupied with the way I thought things should turn out. What I really needed was to get to the point where it wasn’t about me. Through prayer and dedication, I eventually got to where I needed to be. It wasn’t about us anymore. It was about what God wanted for our lives. The day came when I could agree with the psalmist who said, “Not to us, O Lord, not to us but to your name be the glory, because of your love and faithfulness” (Ps. 115:1). Emotionally and spiritually, the change in perspective was dramatic. It not only kept us grounded in our trust of the Lord, but it also helped Jason and me to mature. Needless to say, our growth in this area was not easy; we were being stretched and tested. When you are in a situation like we were in, you sometimes wonder whether it will ever end. Then one day, God spoke to me! He promised me a child. His promise did not come about right away, yet I knew I had heard His voice. And I knew He was faithful. When Jason is onstage, he often tells the story of an evangelist friend who told us to buy a box of Pampers—before we had even conceived. The man’s name is Jay Boyd. Jason has known him since childhood when Jason and his family attended Jay’s revival meetings. Jason played drums for Jay at some point, and they have kept in touch over the years. The way Jason tells it, Jay could preach wallpaper right off the walls. I don’t doubt it. Jay is fearless about saying whatever he believes God wants said. We bought that box of Pampers. Every day it served as a reminder that our promise was on its way. It was a tangible symbol of God’s promise and involvement in our lives,much as the watch from Pastor Parsley is symbolic of God’s faithfulness in Jason’s transition to solo ministry. This pastor encouraged us to be proactive in our faith, thanking God in advance for the blessing of our children. Doing that forced us to take our focus off the past. Jason and I set our sights on what was yet to come. Before six months went by, I was pregnant again! This time, I knew everything was going to be fine. In fact, there was not a single doubt in my mind. I just started thanking God for our baby, knowing that He was taking care of us. He was and still is taking care of us—all four of us! Now, when I look back to the years before the births of Ashleigh Taylor and Emmaleigh Love, I understand why things happened the way they did. The Lord has shown me, and continues to show me, the good that came out of our trial. Night after night, women with similar heartaches come to our table. They are hurting and wondering why, just as we were during those hard years. Now we have precious opportunities to minister to them. And because we walked through the same flames, these women realize that they can come through the fire too. God is faithful. He will comfort others as He comforted us! He will help others to understand the things He helped us to understand. They too will come out of the fire knowing that “ . . . neither death nor life, neither angels nor demons, neither the present nor the future, nor any powers, neither height nor depth, nor anything else in all creation, will be able to separate us from the love of God that is in Christ Jesus our Lord” (Rom. 8:38–39). In His wisdom and because of our experiences, God has given us a special way to share His love. There is one other thing God showed me after our trial ended. I learned that trials are often one part why and an equal part when. It is clear to me now that when Jason and I first conceived, it was not the right time for us. The first five years of our marriage helped us to draw close and build a stronger bond between us. God had something in mind for that season, and it wasn’t children. Through the struggle, we continued to minister. At times, when Shellye and I were on the bus, I’d look over at her and see tears in her eyes. Those tears did the talking even when no words were exchanged. There was a question in my wife’s tears. The question was, “Why?” To this day, I really can’t say why Shellye and I endured the devastation of miscarriages. At this point, I’m not sure I need to know. I do know this: our experiences have helped us to bless others. So many people suffer the heartbreak of losing a baby. The numbers are staggering. In fact, depending upon the statistical source, as many as one out of four women suffer a miscarriage. There are a lot of hurting people behind those numbers. For Shellye and me, it is easy to relate to them. We know what it is like to lose a child. It is hard—really hard. Yet even in the midst of our losses, we were not without hope. Nor was I without a voice. I just kept singing “Through the Fire” and “Still Holding On.” I knew I could trust God to show up and carry me past the pain again. Those two songs encouraged Shellye and me when we needed it most. It was as though God was saying, “I am faithful, and I will continue to be faithful.” He was giving us, through whatever means necessary, the strength to heed the words David wrote during his own desperate times: “Be strong and take heart, all you who hope in the Lord” (Ps. 31:24). God used those songs to renew our hope and refresh our souls. He used people too. Shellye told you about Jay Boyd and the Pampers. Jay knew my family for years. His and my dad’s relationship dated back before the Crabb Family Singers to the days when my dad was a minister. I remember Jay in the pulpit—the man could preach! I am thankful that our relationship has continued throughout the years. Jay told Shellye and me to thank God for the promise before it came to pass. He said we needed to do what the Bible says and call “things that are not as though they were” (Rom. 4:17). We needed to be like the men who tore the roof off a building because they believed Jesus would heal the paralyzed man they brought to Him (Mark 2:1–12). We needed to be like Jairus trusting Jesus, even in the worst circumstances (Mark 5:22–43). We needed to come to the place where no matter the setbacks we would remain focused on the love and power of God to bless and heal. In the midst of an ordeal like that, there are moments when you feel hopeless and unable to push past the sorrow. We often minister to people who feel exactly that way. Our hearts break for them, because we understand. We are so privileged to pray for them. How blessed we are to hear their testimonies afterward! Some of them write us to say that they have given birth. Others are ecstatic when they tell us that God answered their prayers through adoption. Still, I know that some of them have yet to see their dreams fulfilled. For those who have had miscarriages, there is good news: your babies are in heaven. So are our babies. As hard as it was to lose them, I get excited to think that someday Ashleigh and Emmaleigh will meet their siblings in heaven! At some distant day, all six of us will be there together. It is not easy to be strong and take heart when things happen in defiance of God’s promises. In those crushing moments, it is hard to know what to think or how to respond. Should we trust in silence and ignore our doubts? Or should we deny our emotions, as though we were not in turmoil? Our responses to difficulty have a lot to do with how we were raised and what we have been told about God. Some people say we should never, ever question God. Yet some of the greatest leaders and prophets in all of history have asked Him tough questions. When Abraham learned of God’s plan to investigate the sin of Sodom and Gomorrah, Abraham pressed God to share His intentions. He wanted to know whether God would kill his nephew Lot and Lot’s family along with the depraved. Abraham asked God point-blank, “Will you sweep away the righteous with the wicked?” (Gen. 18:23). He continued to press God until God assured him that the handful of righteous people living in the forsaken place would be spared (Gen. 18:24–32). My point is this: if you have taken oxygen into your lungs, you know that life is marked by trials and heartaches. We experience circumstances we don’t understand and don’t want to embrace. We have questions and will continue to have questions as long as we are breathing, and maybe even after that. Who is better able to answer us than God? He wasn’t surprised by Abraham’s questions, and He won’t be surprised by ours. She lost her health insurance when she took the new job. That sounds like trouble enough for someone with an incurable disease. Yet she feared something worse. She feared being without work. She had a family to support and was worried about getting fired. I got the sense that she was a single parent. Whatever her status, she was obviously under a lot of pressure and had decided to make choices designed to improve her lot. She believed her new job would open a fresh chapter in her life. As the tears streamed down her cheeks, I started praying for words of encouragement, something God would have her hear. In my mind, I imagined the questions piercing her heart. Although her unanswered questions lingered, I knew she would be all right when she said, “I have to get back to living.” Her life had been as tough as nails, but she was not about to give up. Nor was she willing to accept the bleak picture the devil was trying to present to her. We must never forget that the devil is a liar. Lying is his stock and trade. Therefore it is up to us to take the offense where he and his lies are concerned. When he tempts me, I like to ask myself this question: What if Satan had to tell the truth about himself, about God, and about our destinies? What kind of picture would he paint then? How successful would he be at killing, stealing, and destroying lives if he could suggest nothing but truth? The answer is that he would fail miserably at deceiving us. Unfortunately, truth is not the enemy’s hallmark. He continues to seek those “he may devour” (1 Pet. 5:8, kjv.) The sense I got from the woman who wanted to get back to living was that she refused to be devoured by a liar. She was determined to keep moving forward. I like to see that kind of tenacity. People like her are hard to forget. In fact, I will never forget her or that altar service. There are so many memories like that. The people we meet touch our hearts as much as we do theirs, if not more. I remember an outdoor concert from some years ago, before “Through the Fire” was completed. In fact, at the time, Dad had only part of the song worked out. He had started it at the piano, but after a year, he was still stuck; the rest of the song just wouldn’t come together. We had a product table at the concert. On that particular day, Dad was behind the table, and I was standing nearby. A woman walked up to Dad with a child in her arms. The woman asked Dad, “When you get back on the bus, will you pray for me? My son needs an operation, and my husband just left me.” We prayed for her right there. Her parting words were as riveting as her prayer request. We were reminded once again that there is always someone who is going through something worse than what we are experiencing. God used her to put our lives and issues into clear perspective. Another LitFuse book tour! 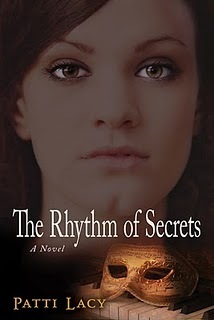 This time, it is for The Rhythm of Secrets by Patti Lacy. "About the book: Since 1955, Sheila Franklin, a talented musician, has perfectly performed the role of devout pastor’s wife, locking away her past as Sheba Alexander and Sylvia Allen. Her carefully constructed façade crumbles with a single phone call from a young Marine named Samuel, the illegitimate son she secretly put up for adoption. Samuel begs Sheila to use her government contacts to get his fiancé, Mali, a Thai prostitute, into America. A dangerous mixture of love and guilt spurs her to help her only child even though it devastates her husband Edward and exposes her questionable past. After a quarrel with Edward, Sheila and Samuel board a C-130 for Thailand and then search Bangkok’s steamy streets for a Madonna-faced prostitute. The two whisk Mali from a brothel but are seized by a warlord who considers Mali his “number one girl.” In a teak “ghost house,” Sheila discovers God’s grace and gains the freedom she needs to find her own identity—Sheila, Sylvia, and Sheba. A framed story, this novel has roots in the bohemian 1940s New Orleans French Quarter and spans three decades, including the turbulent Vietnam era." My take: Okay, I had a tough time getting too far into the book. Knowing that Sheila had an illegitimate son sometime back in the 1940s before starting to read, and then reading the opening chapters where that son calls her and wants to meet her made some of the flashback story a little hard to do. This isn't exactly a spoiler... when Sheila starts telling her story, she goes back to when she was nearly 14... and she ends up traipsing around New Orleans with a huge amount of money as she is out doing some collections for the local mafia. I was totally NOT wanting to read about how she ended up raped and pregnant, or ended up in a brothel and pregnant... and I set the book down mid-chapter and didn't pick it up again for a few days. I just could NOT go on. So here is the non-spoiler part: She returns from the collection run a little freaked out, but not physically harmed. She's 18 before she ends up having that illegitimate child. And maybe I should have been able to figure that part out for myself based on ages and dates given, I haven't gone back to reread it and see. Once I got through that part though, I got totally sucked into the story and had a hard time putting the book down. What I liked more than anything is that Lacy writes most of her significant characters in a way that makes me feel like I can see their point of view, and understand why they are doing what they do. I expect to see Sheila's side of things. Samuel, her son, is also central and you definitely get in his head. But you also really get to understand so many of the other characters too -- Edward (Sheila's husband), Sheila's grandmother and parents, the nuns in St. Paul, and even her grandmother's lawyer. Really, there are very few characters in the book who you end up loving to hate... the warlord in Thailand being the notable exception. Even with some of the awful things that some of the other characters do in the story, knowing more of their backstory helps you to feel sorry for them while hoping that you wouldn't respond in such a hateful way in similar circumstances. I really enjoyed this book. It had a number of surprising twists and turns. I'd have loved for more time to have been spent in St. Paul, but that's just me. Patti Lacy is celebrating the release of her latest book with a NOOK Giveaway, blog tour and Book Club Party! Follow the blog tour and read the reviews! Patti and her publisher, Kregel Publications, are giving away a NOOK prize package worth over $150 to one lucky winner!!!! To enter, simply click on the icons below to fill out the entry form/s, then tell 5 or more friends about the contest. Oh, and enter soon! Winner will be announced on February 16th at Patti's Rhythm of Secrets Facebook Party. Patti will be announcing the winner of The Rhythm of Secrets NOOK giveaway at her Party on Facebook February 16th! She’ll be hosting a book club discussion of The Rhythm of Secrets and giving away other fun prizes! (signed copies of her books and gift certificates to Barnes & Noble, Starbucks, & iTunes!). Don’t miss the fun at Patti’s FB Author Page on February 16th at 5pm PST ( 6 pm MST, 7 pm CST, & 8 pm EST)! As part of the TOS Homeschool Crew, we mostly get the chance to review curriculum, with the occasional "something else" thrown in. Today is a day for one of those "something else" items. 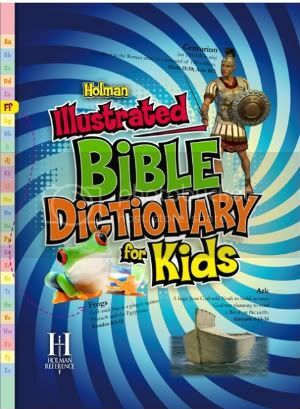 Lifeway Christian Store provided us with copies of the Holman Illustrated Bible Dictionary for Kids. A big (8.5x11") hardcover book, it is a lot thicker than I expected, at over 200 pages. And it is bright, colorful, and inviting. The dictionary is intended for use by 5-10 year olds, and it is supposed to contain definitions for over 750 terms. I'm taking their word for it and not counting. All four of my boys have enjoyed this dictionary. I have two in their age range (6 and 10), and two older (12 and 13). Connor - age 13, has grabbed the book to look things up as he is doing his regular Bible study. For instance, he read some reference to the sons of Zebedee, and he couldn't remember which disciples that referred to. Since this dictionary was right there on the table next to him, he looked up Zebedee and got his answer (James and John) along with an illustration of fishing, and a lot of other information about Zebedee. He also got sucked in by the illustrations, and started reading about zealots and yeast. He has turned to this book a few times since. William - age 12, has grabbed the book and studied the maps, mostly. There are quite a few of them. Thomas - age 10, first went through looking at all the Roman military illustrations. He has since gone through looking specifically for photos of an archaeological nature, either photos of ruins, or of coins, statues, etc. He finds a picture and then works at reading the accompanying text. Richard - age 6, is attracted by the graphics as well, though he is just as likely to be looking at the drawings or paintings. Trina - age 4, loves the colors (blank space is filled with blocks of color) and spends a lot of time on pages like the one on the animals of the Bible. My take? I love this book. I sit down and can get caught up in reading the little snippets of information. There is a lot of meat to this book, which is awesome. When I see "for Kids" as part of the title, I worry that they are going to oversimplify or talk down. Not in this case. The "for Kids" here means gorgeous illustrations and kid-friendly graphics. The content of the text doesn't tend to be difficult, but it isn't simplistic either. You can get a look inside at the publisher's site. This book got 14 thumbs up in this household. Available from Lifeway for $14.99. Disclaimer: As part of the TOS Homeschool Review Crew, I did receive a complimentary book from Lifeway Christian Store. The fact that I received complimentary products does not guarantee a favorable review. It does guarantee a review. A fair review. But I am not going to praise something unless I think it deserves the praise. If I don't like it, you'll hear that. And hopefully with enough detail as to why so you can decide for yourself if what I hate about it makes it perfect for your family. For more about my take on reviews, visit my blog post here. Blog Cruise: Burnout. I've got absolutely nothing helpful to say. This is the episode where I eloquently expound on banishing burnout. Or something, as this week's Blog Cruise is about avoiding burnout. Yeah. Right. I needed this a week or so ago, so that I could read all the wonderful and insightful comments of my crewmates and thereby not feel right now like I just. can't. take. one. more. thing. I don't have any advice. Because I am right there in the middle of it myself right now. I know, I can still prattle on about some ways to avoid burnout, and I can pretend that I'm not solidly in a funk right now. But I really try to be a bit more honest about my life than that. So why am I experiencing burnout right now? It's January. Even after taking time off in November and December, this is a tough month. Everything just seems depressing. I know that. It happens every year. We're trapped. We've got one running vehicle, which means I don't go anywhere. Except on weekends. It's messing with me. We've had all kinds of weird disruptions. This past week, we've had someone in working on our ceilings. The kids have assisted some. It messed with school, so even the stuff I'm motivated to do isn't happening with any regularity. And an extra person in my house means I'm not working out. I know that is not good for my attitude. The kids are feeling trapped. They are currently not at scouts. That means they are on edge and snapping at each other. Which means I'm yelling at them. Which makes them snap at each other even more. And it makes me even snarkier. We started a lot of new things in the fall this year. And right now is the point where I am having to come face-to-face with what is -- and what is not -- working. I don't like dealing with what doesn't work. More importantly, I don't like dealing with WHY it doesn't work. Most of it boils down to "I'm inconsistent." Most of the rest boils down to, "My children have inherited my faults." Not exactly cheery and upbeat thoughts there. We decided that Connor is a 9th grader as of the beginning of the school year (which was three weeks ago). That means I'm starting to seriously deal with feeling overwhelmed by high school. I know it will get better, but at the moment it just feels so... so... so... frightening. I have a bazillion commitments that I don't seem able to keep. I just need to do one thing at a time and it will get better. But it is like everything is screaming "ME FIRST!" and I'm just shutting down. Did I mention I feel trapped? What's the answer? Yeah, right. The answer for you is: don't look to me for a solution. Seasons of feeling overwhelmed are going to happen whether I'm homeschooling or not. They happened when I was single and childless. They happened when I had plenty of money. They happened when we were surviving on $25 a month for groceries for four of us. I can't blame homeschooling for my burnout. My sensation of drowning just coincidentally happened to begin oh, the very day I couldn't find time to do my Bible reading. I have to remember that I am too busy to NOT pray. And my life is too crazy for me to NOT read my Bible. I need to get my priorities back in order. As for everything else, I need to take one thing at a time and just do it.. So, if you do need some great avoiding burnout advice, now that I've whined (thanks for listening!) you can go see what my crewmates say. They're brilliant, and at least one of them is going to have written the perfect burnout post. Sorry it wasn't me. 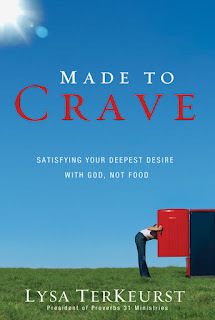 I had the chance to read Made to Crave by Lysa Terkeurst as part of a LitFuse Blog Tour. Tis the season for this kind of thing, I suppose, and after I said yes to this I started to question why I was going through another Christian weight loss book. "About the book: Just because a woman finally fits into her skinny jeans doesn't mean she's won her battle with food. Too often, women overlook the spiritual component to their physical struggle with healthy eating. Made to Crave taps into the desires God gave you to consume food without letting food consume you! Made to Crave is the missing link between a woman's desire to be healthy and the spiritual empowerment necessary to make that happen. The reality is we were made to crave. Craving isn't a bad thing. But we must realize God created us to crave more of him. Many of us have misplaced that craving by overindulging in physical pleasures instead of lasting spiritual satisfaction. If you are struggling with unhealthy eating habits, you can break the "I'll start again Monday" cycle, and start feeling good about yourself today. Learn to stop beating yourself up over the numbers on the scale. Discover that your weight loss struggle isn't a curse but rather a blessing in the making, and replace justifications that lead to diet failure with empowering go-to scripts that lead to victory. You can reach your healthy weight goal - and grow closer to God in the process. This is not a how-to book. This is not the latest and greatest dieting plan. This book is the necessary companion for you to use alongside whatever healthy lifestyle plan you choose. This is a book and Bible study to help you find the "want to" in making healthy lifestyle choices. 224 pages. Companion Bible study DVD set also available." My thoughts: Okay, well, I have to start off with some of the things that put me off about this book. And part of this is colored by listening to Lysa Terkeurst on Focus on the Family recently too. She made a statement on the broadcast that rankles -- "If I can do this, anyone can do this." Or something to that effect. Okay, now, I am one of those people who doesn't have a lot of weight to lose. If I took off about 35 pounds, I'd be ecstatic. I'd be happy with around 25. So it isn't like I'm in a position to make sweeping statements about me either. But really... you are writing a book that will be read by people who need to lose more weight than you started with, and you make claims about how you are the poster child for being out of control and totally changed by God? Okay, so in talking about the numbers, Terkeurst makes the point that redeems the book. This isn't about numbers. It isn't about the numbers on the scale, it isn't about the numbers on the clothing labels. It is about misplaced cravings. It is about "needing" that brownie more than we need God. That is what sets this book apart. It isn't a how-to book. No explicit diet and exercise tips, no big plan to set into motion. This book gives illustrations from the Bible about cravings... and it is making me far more aware of HOW I think about food, HOW I think about exercise, HOW I think about all those other "I deserve" statements in my life. "An undivided heart. That's what my whole journey in conquering cravings was about. When it comes to my body, I can't live with divided loyalties. I can either be loyal to honoring the Lord with my body or loyal to my cravings, desires, and many excuses for not exercising." I am glad I had the chance to read this book. I'm very glad I got past my aversion to the "If I can do it..." I heard on Focus on the Family. And I will be re-reading this book, hopefully with some wonderful results. Because I shy away from the discipline necessary to exercise and to make the right choices, and I do allow Satan to "fill" my cravings with all kinds of temporary stuff when I should be turning to God. But, wait there is more! Lysa will be announcing the winner of the Made to Crave KINDLE Giveaway on February 8th during the Made To Crave Party on Facebook! During the party Lysa will chat with guests, host a trivia contest or two, and give away lots of other fun prizes (copies of Lysa’s other books and Amazon.com, iTunes & Starbucks gift certificates) – including a live Author Chat with Lysa for your small group! Don’t miss the fun! Lysa is looking forward to learning more about you – so be sure to stop by Lysa's Facebook Author Page on February 8th at 5:00 PM PST (6 PM MST, 7 PM CST, & 8 PM EST). I first heard the story of Abby Johnson on Focus on the Family about a year ago (and they happen to be re-airing that yesterday and today... go check it out!) and was really intrigued. Abby was the director of a Planned Parenthood clinic in Texas, and during a 40 Days of Prayer event at her clinic, she ended up walking off the job and walking into the Coalition for Life headquarters. So when I saw she had written a book about her experiences, I knew I wanted to read it. Unplanned by Abby Johnson was a compelling -- and challenging -- book to read. I loved this book. There was so much that struck a chord for me. I started college calling myself pro-life, but I had never truly thought through why I said that. Various experiences in college led me to some pretty similar conclusions to Abby's -- I felt that abortion needed to be legal so that women wouldn't be butchered in back-alley procedures. I wanted adoption to be pushed a lot harder as the preferred alternative. I bought the 'legal, safe and rare' line of the pro-choice movement. My attitudes were fueled by some of the really hateful and unchristian attitudes of some in the pro-life movement. The in-your-face attacks of the 80s convinced me that pro-lifers were really anti-women zealots, though I always believed that many were truly wonderful, caring people... there just were not enough of them to stop the bullies. So, in reading how Abby Johnson got started volunteering and then working for Planned Parenthood, I could really understand. This was a book I couldn't put down. Even though I more or less knew the ending, I found it compelling. And she made me think. It's easy for me (now) to read about how she struggled with the thoughts about late-term abortion but was perfectly okay with the procedure if it happened just a week or two earlier and think -- how could you hold such contradictory views? But don't I do that with other issues? Not that I care to give examples, thankyouverymuch. I just never really thought about why people end up working at abortion clinics. This story reminds me that there are real people involved. And while some of them may just seem evil, many feel they are doing their part to help women and to provide options. They are there because they care. I think anyone who cares about sanctity of life issues really needs to read this book. You can start with the first chapter, or go check out Abby's blog, or check out the book's webpage.